Flight delays are a problem due to the sequester. Travelers have been angry and vocal in their objections. In response, the Senate has approved a fix to allow the FAA to juggle their funds in order to ease some of the delays. Kids in Head Start programs are not going to have the same effect on Congress as angry business travelers. I’m all in favor of fixing the delays for travelers, but the weakest, most at-risk children in our nation are being ignored. Quite literally, the future adult citizens of our country are being punished for the economic failings of the current adult citizens. Our nation’s children need to be a higher priority. Sign the National Resolution on High Stakes Testing! Sadly I must report that today the [Indiana] House passed the bill saying that neither a teacher license nor a superintendent license are needed to be a superintendent in Indiana, House Bill 1357. The final vote was 55-40. Since the House concurred with the Senate version, the bill now goes to the Governor for his signature. The Senate added the requirement that to be a superintendent, the candidate must hold a Masters degree in any subject. The House had passed the first version of the bill 58-40 allowing anyone to be a superintendent, even those with no college degree. The deconstruction of the education profession in Indiana continues. Principals can now brace for evaluations by superintendents who have never been a principal. University programs set up to train high quality superintendents are likely to die on the vine. Look for excellent superintendents to leave the state to find a climate which respects the special training needed to be a successful superintendent. So according to this soon-to-be-law a Superintendent of a public school system in Indiana needn’t know anything about education. On their web site, the Indiana House Republicans boast about the new law creating the Indiana Career Council (ICC). The law was passed with bipartisan support because the “skills gap” needed to be addressed. The same logic, according to the 55 Indiana legislators who voted for HB 1357, doesn’t seem to hold true for school superintendents. Let’s take a look at what superintendents need to be able to do…and see if there are any qualifications needed other than a Master’s Degree — in anything. Stand for Children, a pro-privatization group bent on destroying teachers unions and de-professionalizing teachers, has, on their Washington affiliate’s web site a page devoted to a school superintendent’s job description. What Does a School Superintendent Do? lists the qualities which make for a great Superintendent [emphasis in original]. A great superintendent has a clear vision for the district. He or she works with the school board to set the vision, goals and objectives for the district, and then sees to it that the goals are achieved. A great superintendent is an instructional leader. He or she knows that the most important job of the school district is to make sure students are learning and achieving at high levels. He or she is knowledgeable of the best practices for maximizing student achievement and is supportive of teachers in the district. A great superintendent is an effective communicator. He or she must make a concerted effort to communicate the needs and accomplishments of the district in a variety of formats: through written reports, communication with the media, public meetings and attendance at school events. A great superintendent is a good manager. He or she directs the administrators to accomplish the goals of the district, monitors their progress and evaluates their performance. A great superintendent is a good listener. He or she must listen and take into account differing viewpoints of various constituencies, and then make the best decision. A great superintendent is not afraid to take risks or make a commitment. An average superintendent might set goals that are vague or easily achieved, but a great superintendent would set bold goals that take effort and committment, such as “The majority of third graders will be able to read by the end of the school year,” and then put the programs and resources in place to achieve those goals. A great superintendent is flexible. He or she needs to be able to manage the politics of the job – to adapt to new board members, changes in state funding and changes in the school community while not sacrificing the district’s vision. A great superintendent takes a collaborative rather than a confrontational approach. It’s clear that a quality superintendent needs to be knowledgeable about instructional practices. Doesn’t this imply that superintendents ought to be trained educators? Knowledge of instructional practices…best practices…are not inherited. They are learned through years of actual teaching experience, personal analysis and self-reflection, professional development and personal and professional study. HB 1357 sponsors P. Eric Turner and Todd Huston, neither of whom has a master’s degree, don’t agree with that apparently. Turner is the CEO of T-3 Investment Corporation. Presumably he is qualified to hold that post. I also would guess that the people he hires to work for him have the qualifications to do the job he requires of them. The same may not be true for Huston…He has a bachelors degree in Political Science and is a professional politician. No qualifications required. The point is almost laughably simple for anyone except these 55 legislators. People need to have adequate training in order to do a job well. That includes school superintendents. A career in education is getting harder and harder to pursue. The forces of privatization are changing the educator’s job description to that of a part time worker, untrained, and in transition to a higher paying career in the private sector. The public bashing of teachers continues…and fewer college students are going into education. I wonder why? Classroom teachers, especially those who are just out of college and entering the profession, are more stressed and less valued than at any previous time in our history. They have to listen to a long list of politicians who belittle their ability, blame them for every student whose grades do not reach arbitrary standards, and want to take away every fringe benefit they have — everything from the possibility of achieving tenure to receiving a decent pension. How Do We Retain Excellent Teachers? Do we, as a nation, really want to retain excellent teachers? Do the “reformers” want professional educators? In Indiana, the legislature and the Board of Education have been lowering the qualifications for educators at all levels. Is that how to improve teaching and learning? It’s hard to look at what’s happening to public education and not come to the conclusion that we are doing everything we can to make the difficult job of teaching even more difficult. The profession of teaching, from which all other professions emerge, is being systematically dismantled. Teachers are being punished for their career choice. Fewer benefits, less job security, lower (or no) pensions…all the benefits that used to make up for the long hours and relatively low salary (compared to others with similar training and investment)…are disappearing. 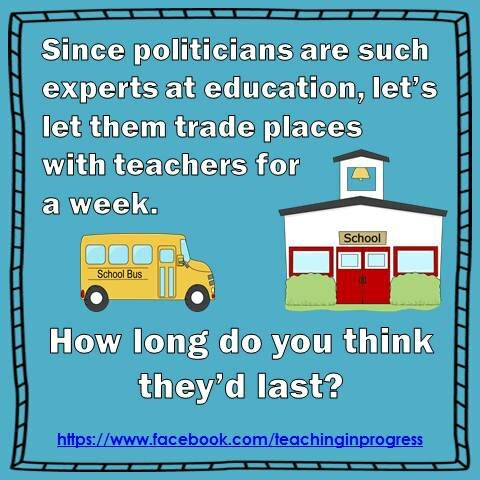 The 50% of teachers who leave before their 5th year will increase until the field of education is just a part time job with a revolving door. Are we serious about improving education? It certainly doesn’t appear so. If we really want to retain teachers, we need to recruit motivated and intelligent people, support them in becoming excellent teachers, provide them with opportunities to direct school programs and curricula, and finally ask their help in supporting a new wave of incoming teachers. This is far easier said than done. We are currently directing most of our money and energy getting on board with common core and finding quick gimmicks for improving data that matters to administrators and districts, but does not always translate into real learning and growth, and often harms it. It escapes me how we can improve education by lowering standards for educators, increasing class size, demoralizing teachers and closing schools. Wouldn’t you think that a Harvard professor would see some relationship between the scandalously high rate of child poverty in the United States–about 23%–and low scores on international tests? If only the professor would explain how the teaching profession will improve when state after state is demoralizing teachers with unproven evaluations based on test scores, stripping away protection for academic freedom, cutting benefits, and lowering standards for new teachers. Wall Street Journal to Teachers: Stop Standing Up For Yourselves! I’m retired. I paid for my “pension” with 3% of my salary every year I taught. Put another way…if I had taken 3% of my salary every year and invested it we would call that a “retirement account.” When the state of Indiana does that for me it’s called a “pension.” It’s the same money…payment to me for services rendered…that is saved and invested. Let’s get this straight once and for all: public employee pensions are deferred compensation. The pensions are not “financed by the taxpayers”; they are financed by public employees who defer pay in a deal that is good for the taxpayer. People who have been pushing testing as the be-all and end-all of education are now backpedaling in the wake of the cheating scandal(s) in Atlanta (and Washington D.C.). EdGator (aka John Kuhn) explains the turnaround. There was a time when most prominent education reformers were in lockstep agreement about the unimpeachable utility of using student test scores to judge teacher quality, but that was before the dogged pursuit of improved test scores went so horribly awry in Atlanta. Recent days have seen some very interesting moves, as several major education reform proponents have suddenly decided they basically agree with Diane Ravitch regarding the negative consequences arising from the inappropriate use of student performance data. Here’s another example of the damage done by people who have no clue about education messing about with education. …Here’s the thing about that statement. Well, two things. First, the comparisons of individual students don’t actually explain what happens when a group of students is aggregated to their teacher and the teacher is assigned the median student’s growth score to represent his/her effectiveness, where teacher’s don’t all have an evenly distributed mix of kids who started at similar points (to other teachers). So, in one sense, this statement doesn’t even address the issue. Destroy public education in order to improve it. In their world, better public schools can be had only by siphoning off students and money into charter and private schools, and by eliminating the cap on class sizes in the lower grades, a factor that has been shown to improve academic achievement. At the same time, the same group of lawmakers is working to put tight caps on preschool education, another success story in education. No, the way the Honorables in the General Assembly are going, the result can only be weaker public schools left with fewer resources to teach the very students the so-called educational improvements were designed to help. Is that their actual intent? Mayor Emanuel wouldn’t send his children to a public school with 30 plus students in a class. He sends his children to a private school (Arne Duncan’s Alma Mater) where the class sizes are in the low 20s. Using that same formula, a CPS elementary school with just 23 kids in each of its “allotted homerooms” would find itself on the district’s “underutilized” list, which, in 2013, is the first step on the road to being shut down. At the mayor’s kids’ school, however, elementary classes are considered “full” if there are 23 students in the classroom. But rest assured the mayor is not going to add The University of Chicago Laboratory Schools to his school-closings hit list. Nor is he urging Lab management to renegotiate the class-size provisions of its current labor agreement with the AFT Local 2063 teachers who educate his kids. What’s the Broad Foundation’s solution to schools where students are not performing well? Simple. Close the bad ones and replace them with good ones. Aggressively close poor-performing schools and replace them with new high-performing schools. States must be much more proactive in this area by refusing to allow chronically underperforming schools to continue operating indefinitely. They should identify, close, and replace at least 10 schools in Program Improvement 5 status each year. Depending on the state, implementation may require coordination among the governor, state chief, and/or state board. Close the “underperforming” public school (read: high poverty) and replace it with a charter* with a new staff of lower paid, under-trained, overworked teachers, replace the administration with under-trained entrepreneurs, raise class sizes, and “counsel out” or otherwise remove students who score low on tests and voilà, a “good school.” Why didn’t anyone think of that before? Would any “reformers” send their children to a school with no school library? What would they say if their school was underfunded? Linda Darling-Hammond focuses on what really matters in education. …focusing on test-based accountability deflects attention from critical problems that need to be solved: higher rates of childhood poverty–nearly one in four children–and homelessness than any in the industrialized world; state funding systems that often spend more than twice as much on affluent schools as on poor ones; crumbling schools in many poor communities that lack textbooks, libraries, computers, and safe facilities. These disparities account for much more of the achievement gap than the effects of individual teachers, but they are tougher to confront. From September until Christmas vacation, [Brookside] was like any school you would imagine. Then, once they got back from Christmas break, for the next nine weeks until testing began, it was a different animal. What they did was drop their curriculum, drop their texts, and instead study exclusively from a standardized-test prep book. Kids weren’t getting a liberal arts education, but prepping to a very narrowly drawn standardized test in primarily language arts and math. Because they were interested in passing the test more than anything else, for that 22 percent of the school year, they taught primarily to the broad middle section of kids that were going to pass. Plus, the school went and reached out to those kids who they thought were on the cusp of possibly passing. So who gets left out? The kids at the bottom and the kids at the top. The unprecedented level of economic inequality in America is undeniable….Bill Moyers shares examples of the striking extremes of wealth and poverty across the country, including a video report on California’s Silicon Valley. There, Facebook, Google, and Apple are minting millionaires, while the area’s homeless — who’ve grown 20 percent in the last two years — are living in tent cities at their virtual doorsteps. The “United States of Inequality” is the major cause of the “achievement gap” in education. UNICEF’s data is important for measuring the share of children who are substantively poorer than their national average, which has important implications for the cost of food, housing, health care and other essentials. Its research shows that children are more likely to fall below this relative poverty line in the United States than in almost any other developed country. But the picture looks even worse when you examine just how far below the relative poverty line these children tend to fall. The UNICEF report looks at something it calls the “child poverty gap,” which measures how far the average poor child falls below the relative poverty line. It does this by measuring the gap between the relative poverty line and the average income of poor families. Alarmingly, the United States also scores second-to-last on this measurement, with the average poor child living in a home that makes 36 percent less than the relative poverty line. Only Italy has a wider gap. *References to charters generally imply corporate, for-profit charter schools. Quotes from other writers reflect their opinions only. See It’s Important to Look in a Mirror Now and Then. Can someone explain to me why education is the one area where “anyone” and “everyone” can be an expert no matter what their training? This is the same kind of thinking that has the Indiana legislature remove all career education requirements for superintendents, or the Indiana School board not require pedagogical training for teachers. It’s the same thinking that allows the President of the United States to appoint a Sociology major/professional basketball player to the office of Secretary of Education. It’s the same sort of thinking which gives people like Bill Gates power over education policy when his only qualification is money. …an outside law firm to help him craft a package of school-related legislation that would aim to lift student achievement and address points of friction between the city’s traditional and charter schools. “What I’m looking at is how we have reforms cascade into classrooms,” said Catania, who has been critical of the pace of school improvement under Mayor Vincent C. Gray (D). Yes. You read that right. In order to expand the “reforms” so they actually effect children in classrooms…he’s asking for help from a team of lawyers. He wants to set performance targets — read: test scores — for schools. He wants to set consequences for schools — read: punishment — when the students can’t reach the required scores. Do the “consequences” include any professional development? Do they include any social safety nets or wraparound services for students? 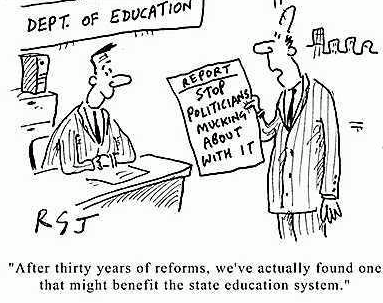 Or are the consequences the “reformer’s” “status quo” options of blaming the administrators, teachers and students? How many of the lawyers on the team have any experience teaching kindergarten, special education or middle school? Have any of them ever sat on a curriculum committee or a report card committee? How many have ordered books for a school library? How many times in the past 10 years have any of those lawyers had to have a parent conference to discuss a child’s academic and social progress? How many nights have they stayed up till 1 AM grading English themes, or carried a stack of math papers with them in the obligatory teacher’s tote bag so they could grade them while standing in line at the license branch, in the airport, or while waiting for dinner at Applebee’s? international firm with wide areas of practice in government and industry, including K-12 and higher education. Who is he going to get when the school system is sued for malpractice — a team of architects? He has support on the council for this, too. Council member David Grosso (I-At Large), a member of the Education Committee, said he will push for strong community engagement but supports Catania’s approach. I should be used to this by now, yet once again I’m astonished by the sheer stupidity…the gall…the slap in the face directed at professional educators everywhere. What kind of education should we provide for our children to foster this sort of creativity? Would the Common Core encourage this sort of experimentation? How about testing? Did the musicians/woodworkers/engineers who performed this piece understand the concepts of physics and mathematics? What would J. S. Bach think? Jesu Joy of Man’s Desiring is the most common English title of the 10th and last movement of the cantata Herz und Mund und Tat und Leben, BWV 147 composed by J. S. Bach in 1716 and 1723. It was written during his first year in Leipzig, Germany. Lead can have devastating effects on school performance. . . A child who is lead poisoned as a toddler can continue to have problems in school all the way through adolescence, even if the lead hazard was found and removed. Indiana is fortunate that our Maternal and Child Health Division at the State Department of Health was able to take over the funding for Lead and Healthy Homes when the funding at the national level dried up. I don’t know if other states were as lucky. Any legislator that claims to care about education must acknowledge the importance of a healthy home and school environment. The Arizona School Boards Association has published a report (available in pdf) titled, A Strange Ignorance The role of lead poisoning in failing schools.. The executive summary contains the following. Not all children can learn, not when they have been poisoned. If environmental lead, instead of calcium, is incorporated into a child’s rapidly developing brain tissue “between birth and age three,” those tissues will not function correctly. Ever. By the time children reach the public schools, the damage has been done, and it is irreversible. to drug use because untreated sufferers find illegal drugs help to medicate the agitation caused by lead damaged brain cells. What is it that prevents school “reformers” and their legislative pals from dealing with the effects of poverty on nearly a quarter of our children? What is it to deny those effects and blame teachers, their unions and public schools for the failure of our nation to provide an adequate environment for children to grow. Is it ignorance? Neglect? Greed? Poverty and Potential: Out-of-School Factors and School Success. (1) low birth-weight and non-genetic prenatal influences on children; (2) inadequate medical, dental, and vision care, often a result of inadequate or no medical insurance; (3) food insecurity; (4) environmental pollutants; (5) family relations and family stress; and (6) neighborhood characteristics. These [out-of-school-factors] are related to a host of poverty-induced physical, sociological, and psychological problems that children often bring to school, ranging from neurological damage and attention disorders to excessive absenteeism, linguistic underdevelopment, and oppositional behavior. Also discussed is a seventh OSF, extended learning opportunities, such as pre- school, after school, and summer school programs that can help to mitigate some of the harm caused by the first six factors. The greater the lead poisoning in a Detroit Public Schools student’s blood, the higher the likelihood he or she will do poorly on achievement tests — even after accounting for contributing factors such as poverty. That’s the finding of a collaborative study that provides one of the most detailed assessments yet of the impact of lead poisoning on students’ learning ability. The study included students in Milwaukee Public Schools, and was coordinated by researchers at UW-Madison and the Wisconsin Department of Health Services. The study found that environmental lead exposure poses a significant challenge to schools striving to meet WKCE standards. A new [Duke University] study says many Connecticut students who have been exposed to lead in paint, soil and elsewhere are performing poorly on standardized tests compared to their peers. The so-called “reforms” which are being carried out across the country focus on firing teachers and administrators, closing public schools, increasing testing, providing vouchers, increasing charter schools, and evaluating and paying teachers based on test scores. Instead of wasting time, money and children’s educational opportunities on unproven “reforms,” states should concentrate on reducing the effects of poverty on their citizens. Lead poisoning is still a real and serious issue affecting students’ health and achievement.